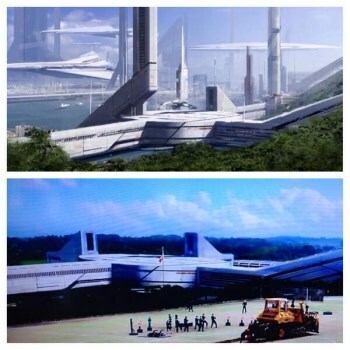 Marvel's Agents of SHIELD has been spotted using Mass Effect 3 concept art as a backdrop in one of its episodes. A sharp-eyed BioWare Social Network user by the name of "fhweufhewiu" noticed something odd - and oddly familiar - in the recently-aired episode of Marvel's Agents of SHIELD entitled "The Bridge." An outdoor scene in the episode bore, to his eyes, a striking resemblance to some Mass Effect 3 concept art, specifically the limited-edition lithograph "Earth Alliance." A bit of investigation, backed by a side-by-side comparison, confirmed his theory. There are some changes, such as the removal of the trees, the tower and of course the Normandy and other ships, but the base images are undeniably and unmistakably identical. The obvious question at this point is whether the ABC network or Marvel had permission to use the art in its show - or, I suppose, whether it needed permission at all. Some of you may also be enjoying a certain small amount of schadenfreude over EA's creative work being nicked for use in someone else's production. We've dropped an inquiry with EA (about whether ABC had permission, not how they feel about the irony of the whole thing) and will update if and when we hear back.